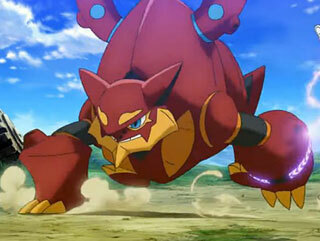 You've got three weeks to grab your very own Volcanion for free! Nintendo and The Pokemon Company have been giving away legendary Pokemon in celebration of the 20th anniversary of the game. This month, they're giving away Keldeo, a legendary that was previously only available to those who purchased Pokemon Black 2 or White 2 within a month of release. You can get it now through October 24 by just going online and using the "Receive Gift" option. But there's a second legendary available this month: Volcanion. This is the first time that it's been available outside of Japan. It's a unique Pokemon, because it's both Fire and Water type. When you download Volcanion, it will have the Flamethrower, Hydro Pump, Explosion, and Steam Eruption moves. Additionally, it will have the Water Absorb ability, which means that Water-type attacks will heal it instead of causing damage. It will also be equipped with an Assault Vest, an item that boosts Special Defense but prevents the wearer from using any non-damaging moves. All you need to do to get your Volcanion is head to the nearest GameStop and ask for it. Once you have the code, you just need to enter the code into the game using the "Get With Code" option. Volcanion is only available until October 31.